On Saturday, November 18th, Kayleigh Williamson and her mother, Sandy, spent the morning training on Town Lake and then sat down with William Dyson for the next Staying Vertical interview. 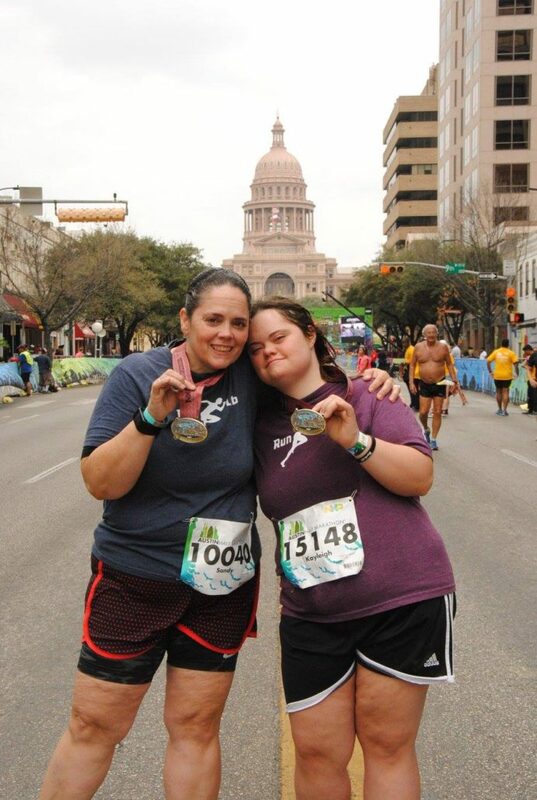 Kayleigh is a highly decorated athlete and became the first runner with Down syndrome to complete the Austin Half Marathon in 2017. During the Staying Vertical interview, they chat about what it felt like to cross the Austin Half Marathon finish line, the support of her friends and coaches, what’s it like to impact people around the world, and who would win if she and her mom competed in various events. Read her interview below and if you see her on the trail or running around town give her a huge high five! Follow Kayleigh on Facebook and join Kayleigh’s Club today! You can see all her recognition and awards at the end of the interview. Kayleigh’s Club at the Austin High Track. William Dyson – You’re a runner. When did you begin running? Why? Kayleigh Williamson – I started running in 2013 because of my health. I had to take medication for Grave’s disease. I’m in remission now, no more medication. But I still take vitamins. WD – In addition to running, you’re a decorated basketball player and swimmer. Why is physical fitness important to you? KW – Because it keeps me moving. I’ve been playing basketball since 2006. I’ve been swimming since 2008. WD – Aside from running, you have to choose one: basketball or swimming. Go. KW – Swimming (without hesitation). WD – What are some positives you see from remaining so active? What are some obstacles? When I started running more I had a leg injury. I went to RunLab and they fixed the pain. 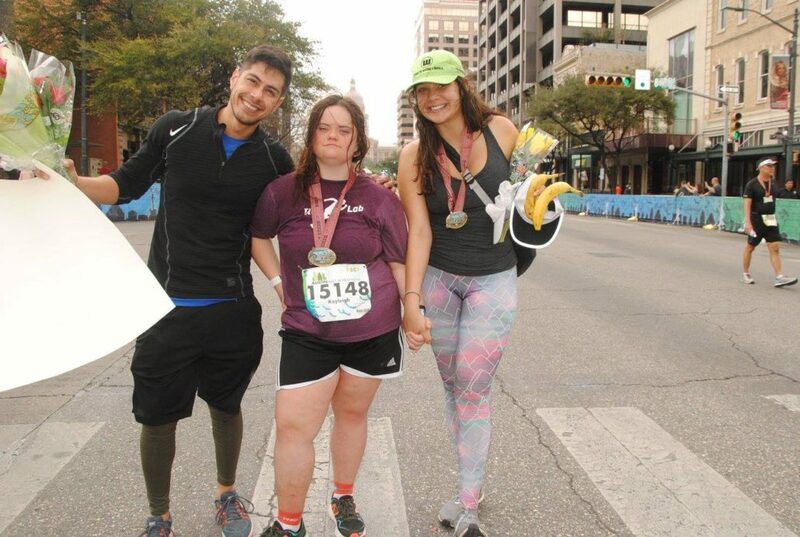 WD – Earlier this year, you became the first individual with Down syndrome to complete the entire Austin Half Marathon course. What was going through your mind when you crossed the finish line? KW – I remember crossing the finish line and felt so happy that I had to do my victory dance. I was so glad to have my friends at the finish line. 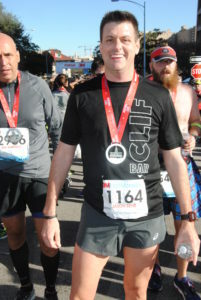 My friend Shane from RunLab was there the whole time, holding my hand at the finish line. Shane would play Britney Spears, she’s my favorite because she’s from the same place as me, McComb, Miss. WD – You’re a superstar. What was it like to get coverage on ESPNW, Runner’s World, TODAY, and People? KW – I really do like it. I liked being on TV, talking about my mom. I’m proud of myself. I do races and events for my grandma. She has a bad memory, she can’t walk or run. She’s my motivating factor. WD – Your story has been seen and your impact has been felt around the world. You’re positively impacting others with your accomplishments. How does that feel? KW – It’s a good thing. I’m proud of myself. I’m showing everyone what I can do and that they can do it too. WD – You plan to run the 2018 Austin Half Marathon. Do you feel like you have unfinished business? 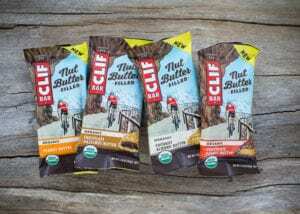 WD – What are your race-day goals for February 18, 2018? KW – I want to improve on my time. I want to run more of the course and walk less. WD – How is training coming along? KW – I ran four miles today (11/18) I’m doing good. I have my mom and my friend at 24-Hour Fitness, Gabriel, who helps me with the weights. Capital Metro takes me everywhere: 24-Hour Fitness, RunLab, McBeth Recreation Center. WD – Take me through your Saturday training regimen. KW – I get up early at 5:30 to run. I go to my Weight Watchers meeting with my best friends, Norma and Beth Ann. I roll at home with my pink Worm. I have a monthly dance at McBeth Rec Center on Saturdays. WD – You can give advice to someone who’s beginning to go through a situation similar to yours. What is that advice? 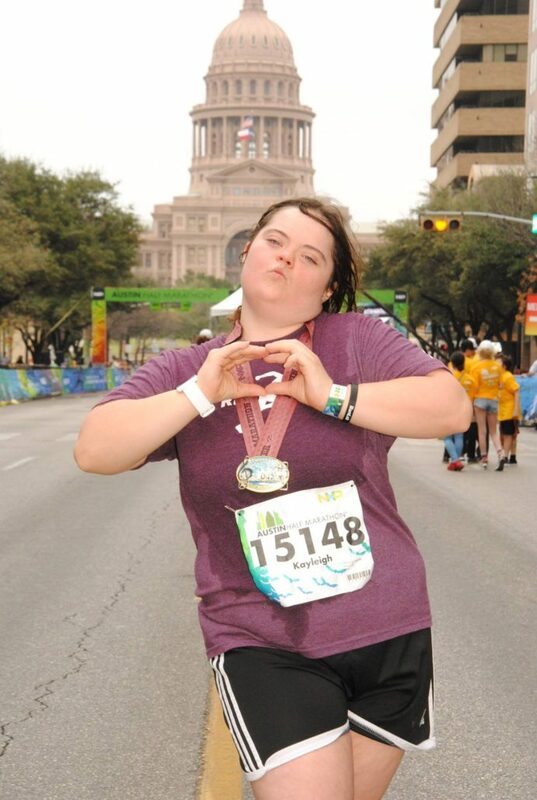 KW – Come run/walk the Austin Half Marathon with me! WD – You’re training, you’re exhausted, you want to quit. What keeps you going? KW – I keep going because I want to beat my mom. 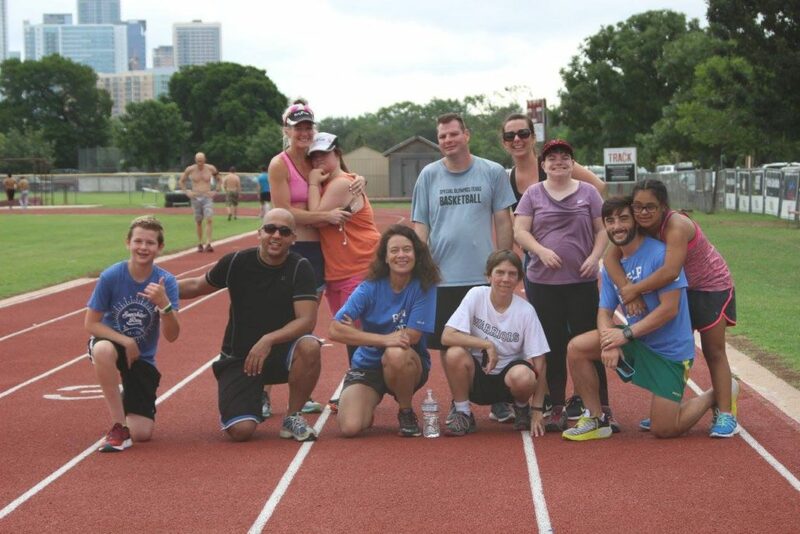 WD – How do your RunLab coaches inspire you? KW – I inspire them! Dr. Davis started Kayleigh’s Club. Natasha is now the coach of Kayleigh’s Club. She’s a sweet girl, she’s with me every step of the way. WD – You have a big supporter and training partner in your mom, Sandy. How does that impact you? KW – My mom challenges me, I love her. I call her Coach Mommy. She’s my sweetheart. On Mother’s Day, I tell her she’s the best mom in the whole world. She plays Bohemian Rhapsody for me. KW – 100m dash – Me. One mile – My mom. Basketball game, first to 10 points – Me, I’ve been playing basketball for a while. 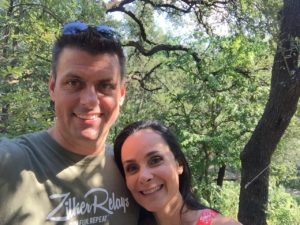 WD – Favorite place to swim and run in Austin? KW – Dancing at McBeth Rec Center. WD – What do you do for fun? KW – Dance in the car with my mom, I’m the better dancer. We listen to Shania Twain, Man I Feel like a Woman, and Aretha Franklin, You Make Me Feel like a Natural Woman. KW – West Gate Central Market, WestGate and Mr. Natural’s. KW – Town Lake, I want to show them where I run. KW – Christmas and Valentine’s Day. KW – Both, we have four dogs and a cat. Their names are MegPie, Shadow, Nara, Maggie Mae, and Hercules (cat). KW – Red and black, those are my swim team colors. WD – Kayleigh, thank you for taking the time to visit our office and lend your time for this interview. I had a blast getting to learn more about you, your motivations, and the amazing things you’ve done. We wish you all the best and we’ll see you on the trail and then at the start line on February 18th. Keep training and working hard and you’ll accomplish all your goals. Thanks for bringing your mom! KW – You’re welcome. Thank you for interviewing me. I tried to keep my mom from talking too much. I will keep working hard because I want to beat my half marathon time and my mom. I also want to have more friends run with me. You can come to one of the workouts with Kayleigh’s Club. See you soon! Recognition – At State (this last October), Kayleigh medaled in the 100m freestyle, the 50m backstroke, and the 25m breaststroke. She has more than 15 medals at Area and State in swimming and more than 10 in basketball in Area and State. She just completed her second 10-mile race (Run for the Water) in addition to 14 5K races, two 10K races, and two 8K races. 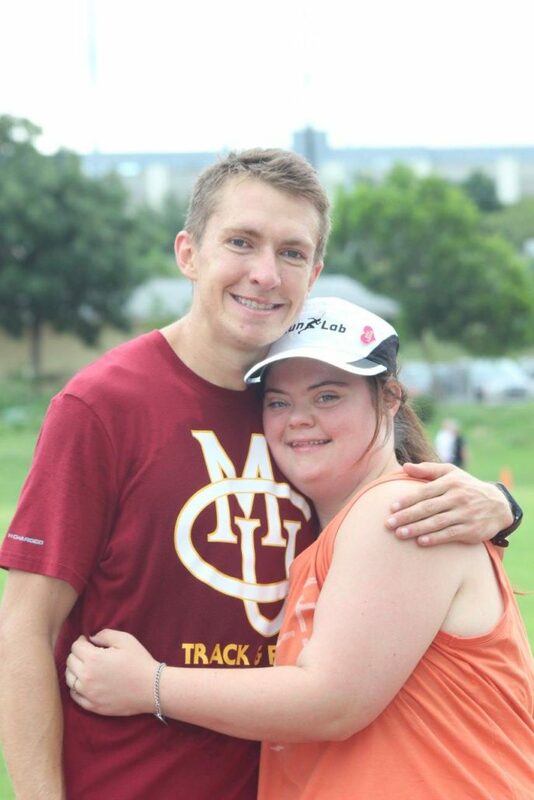 She has Special Olympic medals in tennis, cycling, bowling, and track. The longest distance she has swum is 1600m. Kayleigh was the first individual with Down syndrome to train in International Krav Maga. Krav is Israeli self-defense. She trained for three years. International Krav has to be trained under a Master Krav Instructor. There are only two Masters in the US, one being in Texas. Williamson will be the Ambassador for the Austin Rockin’ Resolution 10-Miler on 12/31.